May 8: Happy Birthday, Cindy Parlow! Happy birthday to Cindy Parlow, three-time NCAA Women’s Soccer Champion and founding member of the Women’s United Soccer Association. 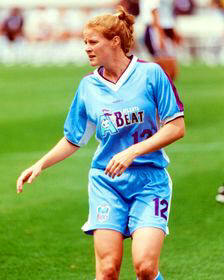 Parlow was a member of the 1996, 2000, and 2004 Olympic, and 1999 and 2003 Women’s World Cup, teams. After playing professionally for the Atlanta Beat for three years, she became the Coaching Director of 13-18 year-old girls’ programs at the Triangle United soccer league.